The liver is a vital organ, meaning that one cannot live without it. The liver serves many critical functions including metabolism of drugs and toxins, removing degradation products of normal body metabolism (for example clearance of ammonia and bilirubin from the blood), and synthesis of many important proteins and enzymes (such as factors necessary for blood to clot). Blood enters the liver from two channels, the hepatic artery and the portal vein, bringing nutrients and oxygen to liver cells, also known as hepatocytes, and bile ducts. Blood leaves the liver via the hepatic veins which drain into the inferior vena cava which immediately enters the heart. The liver makes bile, a liquid that helps dissolve fat and eliminate metabolic waste and toxins via the intestine. Each hepatocyte creates bile and excretes it into microscopic channels that join to form bile ducts. Like tributaries joining to form a river, the bile ducts join to form a single “hepatic duct” that brings bile into the intestine. 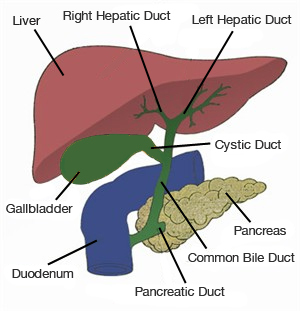 The bile ducts join to form a single “hepatic duct” that brings bile into the intestine. Acute liver failure, also known as fulminant hepatic failure, occurs when a previously healthy liver suffers massive injury resulting in clinical signs and symptoms of liver insufficiency. Any number of things can lead to acute liver failure but the most common causes are acetaminophen (Tylenol) overdose, viral infections (known or yet unknown virus), ingestion of a toxin such as poisonous mushrooms, or an idiosyncratic drug reaction. The liver has a remarkable ability to repair itself in response to injury. Nevertheless, repeated injury and repair, typically over many years and even decades, scars the liver permanently. The end stage of scarring is termed cirrhosis and corresponds to the point where the liver can no longer repair itself. Once a person has cirrhosis, he or she may begin to show signs of inadequate liver function. This is termed “decompensated liver disease.” Although medications can decrease the symptoms caused by the liver failure, liver transplantation represents the only permanent cure. What Is the Follow-up for Liver Transplantation? After liver transplantation, the patient must visit the transplant surgeon or hepatologist frequently, about 1-2 times a week over about 3 months. After this time, the primary doctor may also see the patient, but the transplant doctor the patient about once a month for the remainder of the first year after transplantation. Ideally, the transplant surgeon and hepatologist monitor the patient’s progress through blood tests and contact with the primary doctor. One year after transplantation, follow-up care is individualized. If a patient ever requires a visit to an emergency department, and is discharged from there, he or she should generally follow up with his or her primary transplant doctor in 1-2 days. The incision on the belly is in the shape of an upside-down Y. Small, plastic, bulb-shaped drains are placed near the incision to drain blood and fluid from around the liver. These are called Jackson-Pratt (JP) drains and may remain in place for several days until the drainage significantly decreases. A tube called a T-tube may be placed in the patient’s bile duct to allow it to drain outside the body into a small pouch called a bile bag. The bile may vary from deep gold to dark green, and the amount produced is measured frequently. The tube remains in place for about 3 months after surgery. Bile production early after the surgery is a good sign and is one of the indicators surgeons look for to determine if the liver transplant is being “accepted” by the patient’s body.